The following preparedness guide was obtained from the official website of Senator Heidi Heitkamp of North Dakota, who has advocated on numerous occasions for improving national standards for the rail transport of crude oil. Crude transport by rail has resulted in a number of recent accidents throughout the U.S. and Canada. The document has since been removed from Heitkamp’s official site. This document identifies Federal resources available to help the whole community prepare for crude by rail transportation incidents. 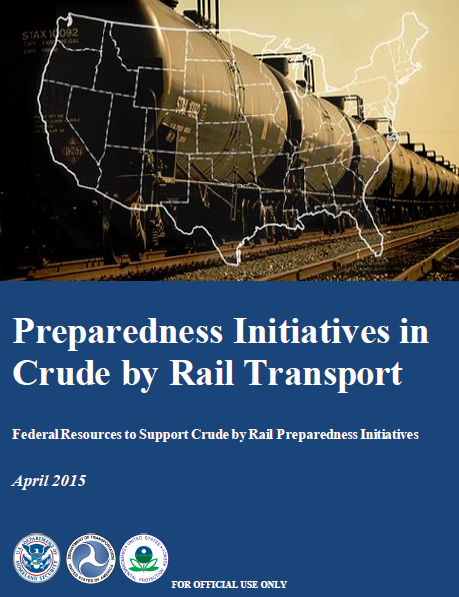 The document summarizes key observations on crude by rail preparedness from discussions with states, information on upcoming exercise series, federally supported training options, and additional crude by rail response resources from Federal agencies. Additionally, this document identifies preparedness resources for state, local, tribal, and territorial personnel to obtain training and exercise support for crude by rail incidents. The Environmental Protection Agency (EPA), Federal Emergency Management Agency (FEMA), and Department of Transportation (DOT) (together, the interagency team) held discussions with states to collect information on existing preparedness efforts for responding to and mitigating the impacts of crude by rail incidents. The interagency team conducted conference calls with the 48 states in the lower continental United States and the District of Columbia. State participants included directors and deputies from state emergency management and homeland security agencies, environmental agencies, transportation agencies, state fusion centers, and local police and fire departments. 1. State Planning: States have taken steps to prepare for crude oil incidents, but do not consider the threat from crude oil to be more significant than other hazardous materials. 2. Training Deficit: States reported crude by rail training shortfalls and requested additional in-state training options for first responders. 3. Exercises: States believe their exercise programs are preparing first responders for a crude by rail incident, but welcome additional federally sponsored exercises involving crude by rail scenarios. 4. DOT Emergency Order: States believe the May 2014 DOT Emergency Order reporting threshold of one million gallons of Bakken crude oil per train is too high and does not help in their ability to identify and prepare at-risk communities. Based on these coordination and outreach efforts with states, the interagency team has identified a range of Federal resources to help the whole community prepare for crude by rail transportation incidents. FEDERAL RESOURCES The following subsections catalogue federally supported incident planning and response information, exercises, and training courses that aim to enhance preparedness across the whole community for crude by rail transportation incidents. Each resource includes additional information for further inquiry. The Federal Government provides leadership and support in oil spill preparedness under a multi-level, multi-agency National Response System established under the Clean Water Act as amended by the Oil Pollution Act of 1990. An EPA-chaired and Coast Guard-vice-chaired 15-member agency National Response Team guides the National Response System. Thirteen Regional Response Teams (RRTs) provide regional support and coordination with states. RRTs also play an active role in planning and preparedness for crude by rail incidents through the development of Area Contingency Plans and Geographic Response Plans. Jurisdictions can call upon RRTs for support during an incident. The National Response System provides a Federal On-Scene Coordinator who integrates into an incident response using the Incident Command System/Unified Command.